Way back in 2010 I made dinner for a friend who just had a surgery. I needed something easy and also something my family would eat since I would make enough for everyone. I settled on what I call dinner with a twist. Making food that is not what it looks like is one of the creative ways I try to get my girls to eat new things. Especially, a couple of years ago when they were just three and five. Dinner that night consisted of cupcakes. Those aren't just any cupcakes though. They are actually meatloaf iced with mashed potatoes. I used one of my large star tips to squeeze the potatoes through to give it more of a decorated feel. Want to see them before I put the potatoes on? They came out very moist. I just used a standard meatloaf recipe and adjusted the cooking time for the pan. I think I did it for about 30 minutes at 400F. Just check to make sure it cooks through. 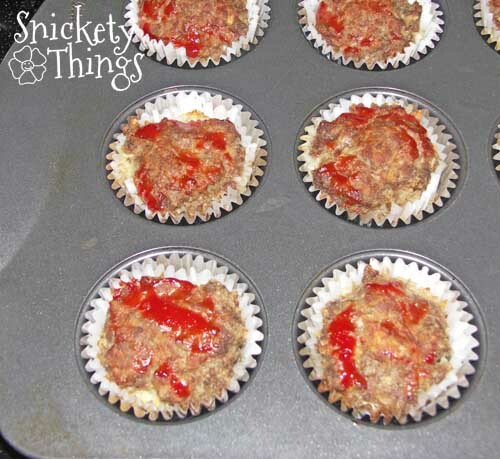 These freeze well and are the perfect serving size for little ones or big ones watching their weight. To freeze, I wrapped in two layers of foil. 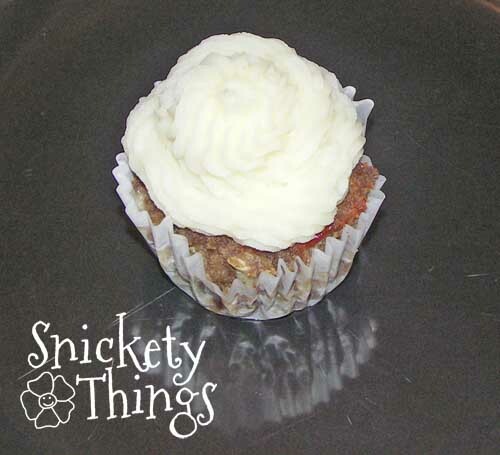 When I reheated, I placed them in a covered container with just a touch of water to keep them moist. 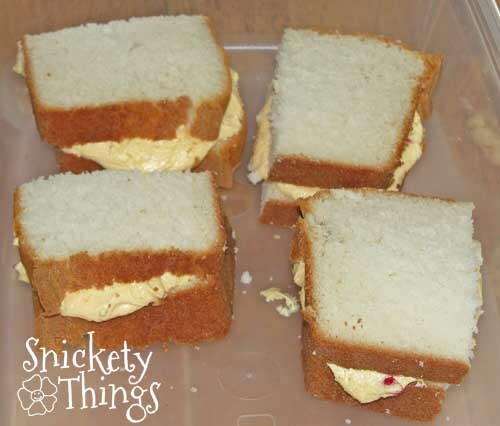 For desert, we had pimento cheese sandwiches. You guessed it. They aren't really pimento cheese, just made to look that way. They are actually white cake baked in a loaf pan and cut to look like thick bread. The cheese is just butter cream icing tinted with Wilton golden yellow gel and just a touch of Wilton no taste red to get that orange pimento cheese has. I didn't put pimento in it either, the red you see is chipped up maraschino cherries. These are best when eaten within a few hours so the cake does not dry out. Or, if needed later, wrap them in plastic wrap to keep them moist. They don't hold up well for more than a couple of days. My girls ate every bit, and my friend's family did too. What fun things do you do for dinner? It was really good. Thinking of doing it her again myself. I can use the leftovers for school lunches. Thanks! It is a fun way to get the kids to eat. 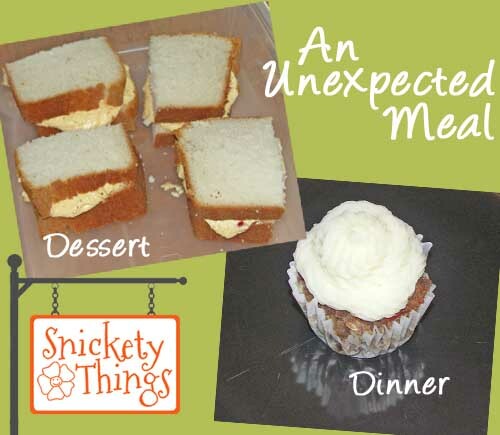 We eat those "cupcakes" every April 1st for dinner and for desert we eat meatloaf (coco-rice krispie treats) and mash potatoes (ice cream). My kids love it! I'm going to have to try your "meatloaf". so so cute. I just love it. This is so clever. What a fun idea. We did it a while back, and you might want to check it out since you are into it right now: http://www.meaningfulmama.com/2012/06/day-160-fathers-day-ice-cream-steak.html - You'd have a lot of fun with that one. Thanks for sharing your ideas. Fabulous. Thanks Jodi! I will definitely have a look at yours. Hope you had a great weekend! This is so cute. I am going to make this for my son. He loves it when I trick him and is always trying to trick me. Visiting from Making the World Cuter... such a cute idea! Love tricking the kids into eating, lol. Thanks! Whatever makes them eat.